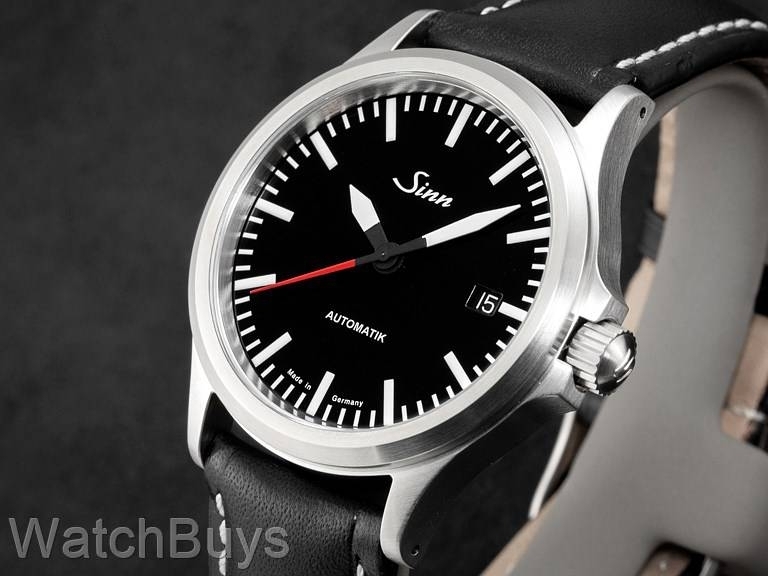 This is is a special edition of the Sinn 556 I - you'll notice the addition of a red seconds hand. We periodically work with Sinn to produce this special edition for those who prefer a more sporty look to the Sinn 556 I. The Sinn 556 I Red Special Edition has all of the great features that have made the Sinn 556 I among our best selling Sinn watches, but with the red seconds hand offers a bit "more attitude". 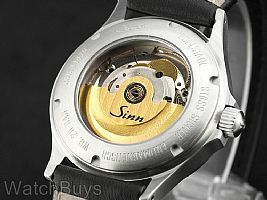 The Sinn 556 I Red Special Edition features a satinized case at 38.5 mm. This finish results in a slightly more polished look while at the same time retaining some characteristics of a matte finish. In addition, the dial features indices ("I") rather than Arabic numerals for a very clean layout. "Built to last, attainable luxury"
Verified Owner Comments: Truly a sight to behold. Love this watch, and its excellent for the price point. Winding feels very nice compared to my previous watch. Got it on a bracelet and it doesn't attract/hold onto as much dirty as many other bracelets I've had. Was worried about the AR Coating on the crystal getting scratches, and while it's so far been just fine, the Coating does show/attract smudges so I'm having to wipe down the crystal with a microfiber cloth on a daily basis, but it's no big deal. Would recommend this watch to anyone looking for a minimalist, simple, yet elegant design on a truly attainable luxury watch. "Simple Elegance or Elegantly Simple"
Verified Owner Comments: One doesn’t think of a pilot or tool watch as being elegant. However, this Sinn 556i is a classy, very attractive pilot watch that I enjoy not only wearing but also just looking at. From the piano-black dial, highly contrasted white hands and indices, and red accented seconds hand, this IS an elegant tool watch. I’m now in the process of strapping it up – maybe a black leather strap with some red piping, or a dark brown leather strap – I think this particular piece is a strap monster. Many straps will look great on it. Plus the quality is readily apparent. I appreciate the 200m water resist and the top grade ETA 2824-2. I'm getting -2 secs/day accuracy on my timegrapher. And the customer service from Watchbuys was excellent. Both pre-sales support where all my questions were answered, to post sales where I received a follow-up call to ensure I was happy with the purchase. I’m very pleased with this purchase from Watchbuys. Verified Owner Comments: This is my second Sinn - the other a U1. This 556 holds it's own against watches that cost a lot more. While a simple watch, it's the details that really stand out. Incredibly legible, comfortable, 200m water resistance, crown guards, excellent proportions, and looks good on many different straps. The finishing on the case is first rate, and that red second hand definitely pops, adding sportiness compared to the normal version. Altogether, just a superb package from Sinn at this price point. Verified Owner Comments: This is my third purchase from Watchbuys. I've consistently found the service to be outstanding, Rob's and Matt's response to questions and phone calls quick, thorough and overall customer service about the best anywhere. Beyond that, the Sinn watches I've purchased are really terrific. Very solid build quality, robust, accurate and always promptly shipped from Watchbuys in perfect condition. These folks do a really great job overall. Thanks for your always good service and products. Verified Owner Comments: The Sinn 556i Red is an awesome watch. Extremely well made, a perfect precision minimalist watch. It is my my everyday watch, love it!